Because BigGuy is a 5th grader, it’s his last year of Cub Scouts. There are a contingent of people back home who can’t believe we would involve ourselves with Scouts because of their historically explicit rejection of homosexuals. Policies have changed about the acceptance of Scouts that are homosexual but I have not kept up on whether that trickled into leadership. Personally, I don’t feel “conflicted” about homosexuals. I’m NOT one nor do I want to BE one, but they don’t offend me and I know enough of them that have suffered immensely trying to be straight. I don’t believe they have a choice; but even if they did–so what? It’s THEIR choice. And frankly, Biblical people have been given one very clear edict and that is to love followed closely by “do not judge”. Let them meet their maker on the terms they feel are okay. You may think they’re wrong and they may think you’re wrong. 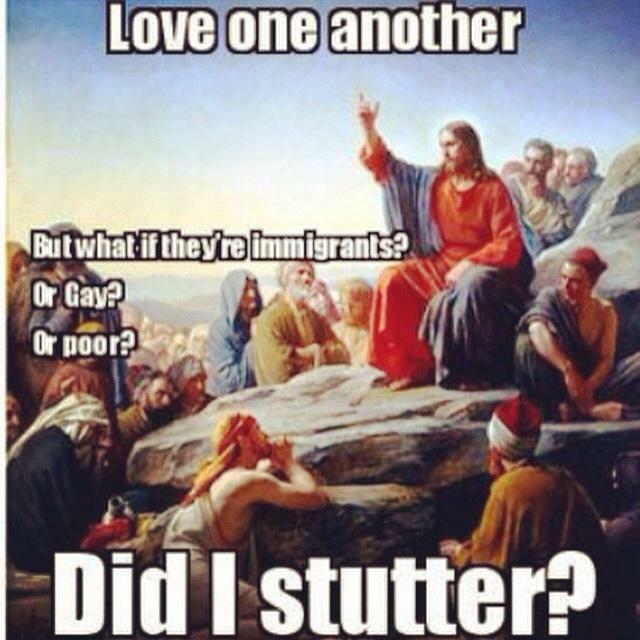 But we are called to love everyone. Having known homosexuals, I know that outside of their sexual preference for gender, they really AREN’T any different than the rest of us. They live similarly with similar values and parenting practices or life goals as most of the rest of us. They have their own contingent of crazies much like the straight (and even Christian) community has their contingent of crazies. But the concern posed to me about my son being in Scouts had more to do with the reality that we could be involving him in an organization that could (under the prior rules) eventually reject him if he turned out to be a homosexual. When we decided to involve him in Scouts, that WAS the policy. We decided that if our son was ultimately a homosexual, this would really not be much different than most of the rest of the world–which would by and large reject him over his sexual orientation. We opted to involve him for the various good experiences we believed he would have and try not to worry too much about something that may or may not ever happen. We also got involved in the leadership of the pack just to be sure we got a “head’s up” to any negative attitudes or behaviors before they got to our son’s level. It had nothing to do with him or how people would treat him (he’s too young to HAVE sexual preferences yet). It had to do with not allowing our child to be involved in a community of hatred or bias to the best of our ability. So we joined Cub Scouts. It’s just occurred to me now that he has gone through all of Cub Scouts in the same group of kids hosted at the same elementary school despite having moved 7 times in the last 4-5 years. ❤ Wow. That’s so very huge for me!! Wait–let me take a moment and really soak this in!! Okay, okay, okay… Anyway… The topic of continuing on has been a pretty big question mark for us because BigGuy has mild Asperger’s but maybe it’s not as mild as I think it is. He definitely has a hard time knowing when he’s in trouble with other kids. He doesn’t know how to handle it when other kids target him to tease or bully. It shouldn’t happen at all, but it does. In Boy Scouts, the boys are (by design) largely left to run affairs on their own. Adults are on standby and therefore not always heavily involved or even overseeing things unless they are overtly dangerous. At one point, I asked two of the young men in the Scout shop what I needed to worry about with a kid like mine. They both turned red. The one that knew me well enough to recognize me as a regular told me that the place where the majority of problems could arise for my kid in the wrong group of boys would be camping. Ummmm… isn’t camping, like, a HUGE part of what they do? Suddenly, I wasn’t “for” crossing over to Boy Scouts. On one hand, I’d LOVE for him to be able to cross over, get into a good pack, and develop a lot of the independent/self-reliance skills that would come with the territory. I’d love to say “leadership skills” because I know a lot of the boys get that, but I don’t know that mine will (or won’t) absorb those. Just being able to do a lot of things on his own and having that build his sense of self and confidence would be enough for me. I think it would be a great experience. In my area, we’ve had lots of exposure to the Boy Scout Troops. They sing ridiculous (and sometimes, mildly crude) songs. They honor the flag (which I seriously think doesn’t get enough reverence in our country). They do things for themselves. They help others. At least the ones we’ve interacted with do. I would love that for BigGuy. On the flip, my mind races with the horrible things that could happen to him with just one really bad kid. And we’ve already dealt with one really bad kid and one really horrifying incident in a place far less prone to that kind of thing than a camping trip where the adults are hands off by design. 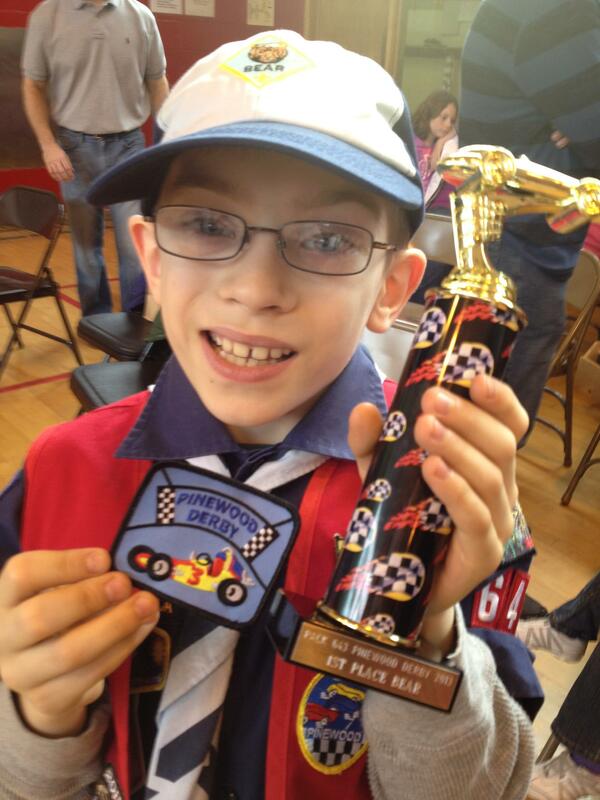 BigGuy winning his third of four Pinewood Derbies (so far) for his rank during third grade as a Bear Scout. Today, Husbeau took BigGuy to an open house of Boy Scout Troops near our home while I took Girly to a park. BigGuy came home pretty much set on a troop he wanted to be involved with. Ironically, it was a troop I had just gotten the low-down on from a mother in the park–and it sounded good. Well-organized and their camping was almost all local (wow–I seriously never considered this! She told me some troops go as far as 8 hours away for their monthly camping and as far as Pennsylvania for their annual “big” trip!). Oh my. She went on to tell me about how engaged their leadership was, and how considerate the Scout leader was when it came to talking to parents and addressing their questions or concerns–spending as much time as they needed. It all sounded great. Then came BigGuy pretty well attached to that Troop… which happened to meet walking distance from our house on a night of the week we were capable of freeing up. 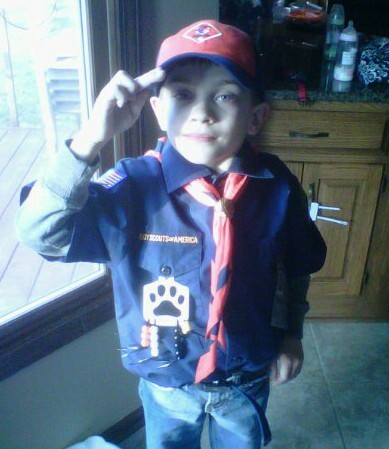 So BigGuy might become a Boy Scout. We shall see.